Summer’s here and the time is right to enjoy the sunshine. This is best done outdoors, of course, but if at some point you get tired of the heat, you may want to take a moment to look at how the source of all this brightness, the sun, has found its reflection in art. That is why Culture.pl brings you this selection of seven 20th-century paintings by acclaimed Polish artists, which evoke the motif of the sun. This tempera-on-canvas painting was created by Wojciech Weiss at the turn of the 20th century, most probably in the year 1900. By then the painter had already met Stanisław Przybyszewski, the eccentric writer who influenced a whole generation of various Polish artists with his view of art as a means of reaching the ‘Absolute’. The encounter prompted Weiss, now considered one of the greats of Polish painting, to paint in a style where he used his artistic sensibility to give depictions of reality a visionary quality. The piece, entitled Promienny Zachód Słońca (editor’s translation: A Beaming Sunset), is a testimony to that. It was created during the artist’s stay in Strzyżów, a town in south-eastern Poland, and shows how he saw the nearby countryside. Here you can see the sun illuminating the porch of the artist Józef Mehoffer’s residence near Kraków. The silhouette of the elegant lady standing outside is most probably that of the his wife . He often portrayed her in his works on the happiness that comes from family life. 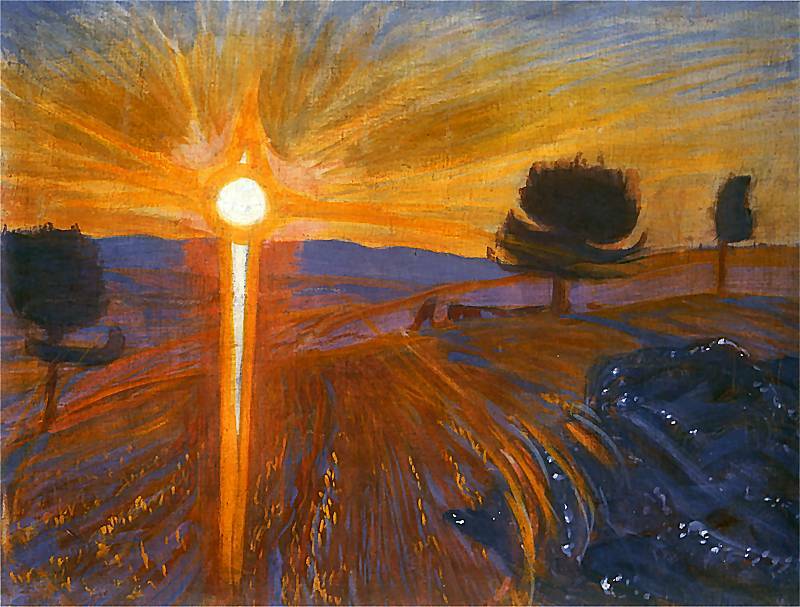 This oil-on canvas painting titled Słońce Majowe (editor’s translation: May Sun) was created in 1911 and is among the most recognised works by Mehoffer who, like Wojciech Weiss, found himself among the classics of Polish modernism. 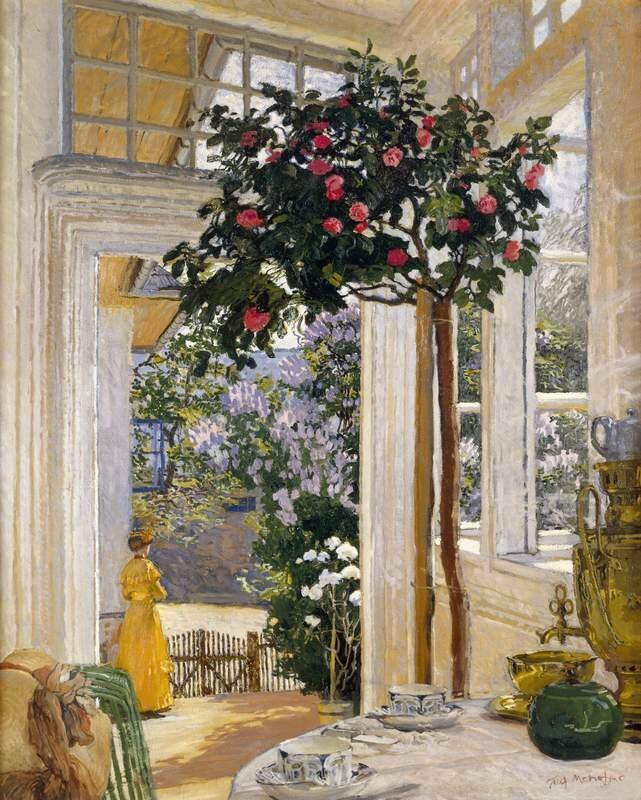 Apart from being a noted painter, Mehoffer was also valued for his stained-glass windows, which can be admired, for example, in the Cathedral of St. Nicholas in Fribourg, Switzerland. 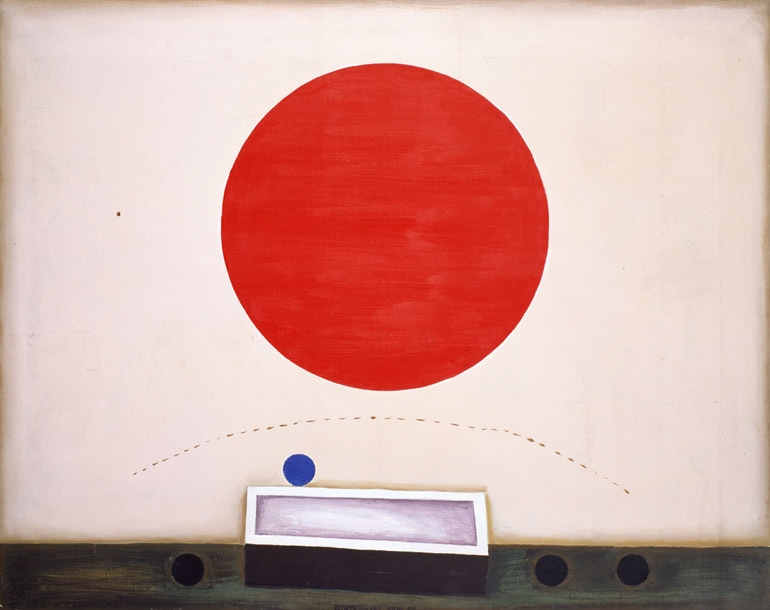 The title of this oil-on-canvas work, created by Władysław Strzemińśki between 1948 and 1949, is Powidok Słońca (editor’s translation: Afterimage of the Sun). In case you didn’t know, according to the Merriam Webster dictionary, an afterimage is ‘a usually visual sensation occurring after stimulation by its external cause has ceased.’ The title of the work itself refers to how human sight functions as a sense – an issue the artist was strongly interested in. The painting’s form, divided into two sections by a diagonal line on its right side, is also evocative of the subject. Experts on Strzemiński believe that the brighter part to the left conveys the sensation of looking at the sun (don’t try this at home! Doctors say it’s very bad for your eyes! ), whereas the toned down part to the right represents the afterimage resulting from it. ‘This is spiritual reality expressed through painting: a line, a shape, a colour.’ That’s how Stanisław Fijałkowski, the creator of 20.VI.60, comments on his paintings in an article about him in the Dziennik Łódzki newspaper. 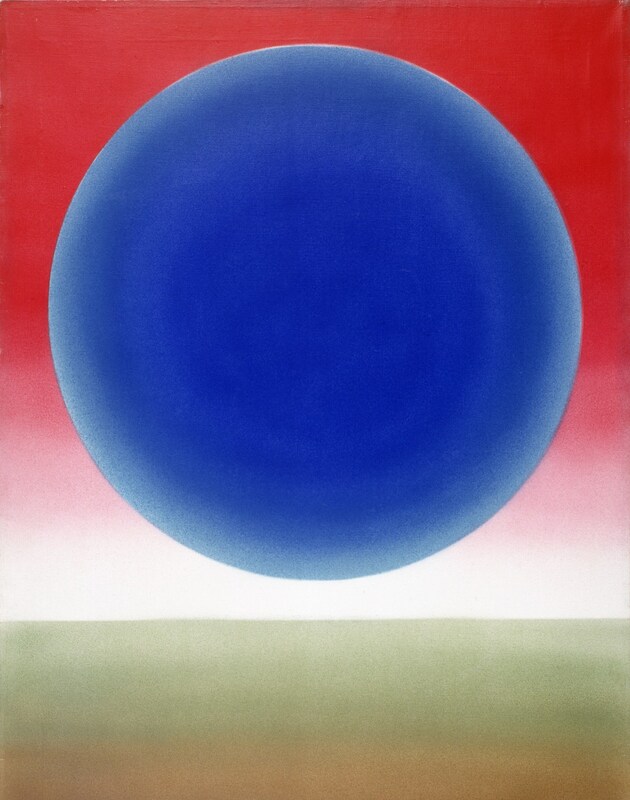 This particular oil-on-canvas piece was made in 1960, at a time when the artist was creating works revolving around the sun and other celestial bodies. It is characteristic of his style which involves showing geometric shapes on plain backgrounds. Fijałkowski, once a student under Władysław Strzemiński at the Łódź Academy of Fine Art, is an artist of international renown whose pieces can be found in the collections of, amongst others, the Museum of Modern Art in New York and the Tretyakov Gallery in Moscow. In his youth Jerzy Nowosielski, the author of this 1963 oil-on-canvas piece, became fascinated with Eastern European icon painting, an influence that he later combined with an appreciation for surrealism and abstract art to create his own signature style. Even though this painting Wschód Słońca w Bieszczadach (Wschód Słońca w Górach) (editor’s translation: Sunrise in the Bieszczady Range (Sunrise in the Mountains)) maybe not be particularly representative of his oeuvre (he’s best remembered for his female nudes), it still shows a motif that recurred in his paintings, namely that of a highland landscape. Here you can see the Bieszczady Mountains that lie in south-eastern Poland, a range where you can stumble upon, among other things, a number of historical Orthodox churches. 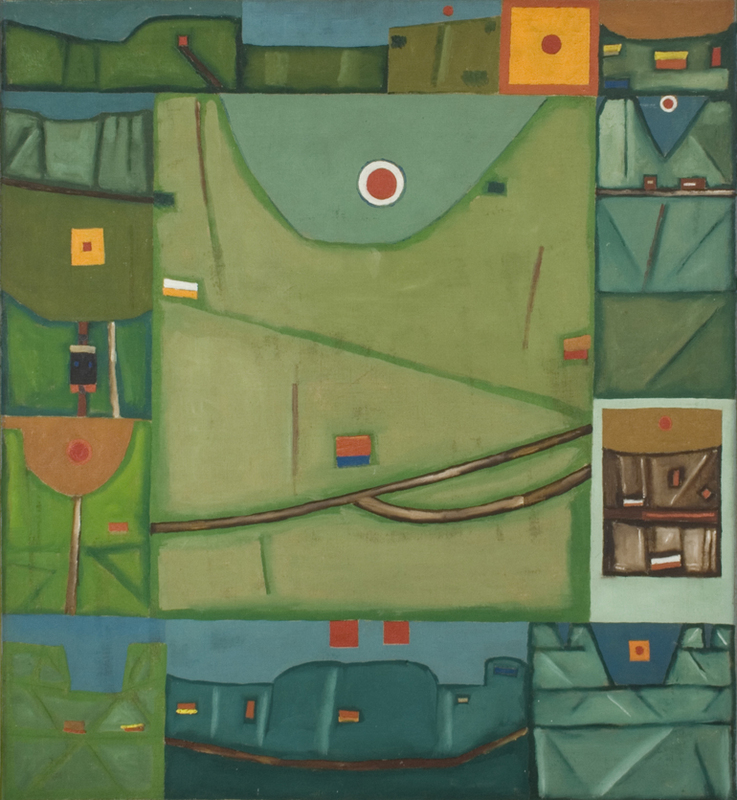 This 1978 acrylic-on-canvas painting by Roman Artymowski titled Pejzaż XXI (editor’s translation: Landscape XXI) is part of a series that the artist began creating in the mid-1970s. Dubbed ‘Solar’ by its admirers, the series consists of very similarly composed landscapes in which a large sphere can be seen above what seems like a horizon. The simple form of these paintings highlights their use of colour, an element the artist was especially keen on and valued for. It’s widely believed that Artymowski found inspiration for these works during his trips to Baghdad and Damascus, cities where he would work as an art teacher. This provides an explanation as to why his solar landscapes tend to be associated with the majestic scenery of the Middle East. Andrzej Dłużniewski, the author of this 1989 acrylic-on-canvas piece, was a versatile artist. 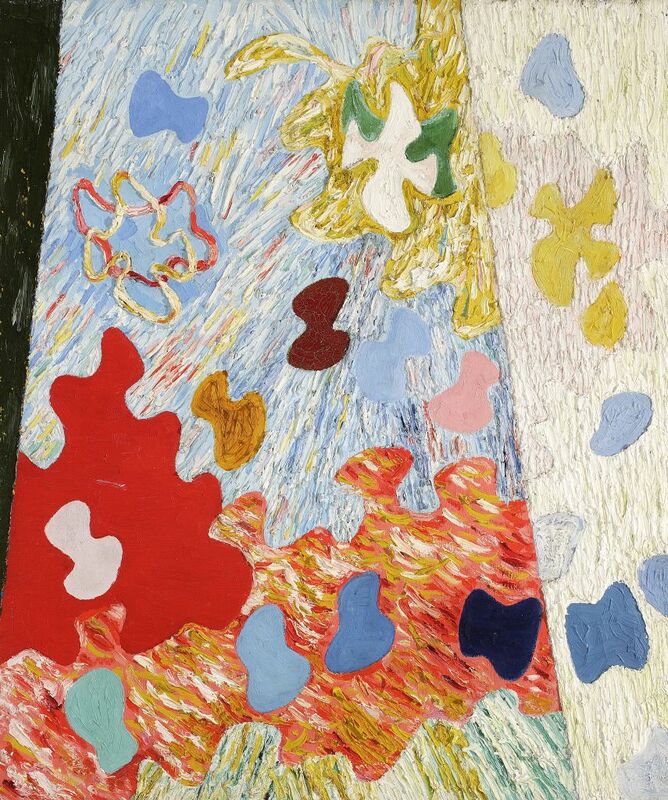 He not only painted but also made collages, installations and was active as a writer. In 2000, he published a collection of philosophical tales entitled Odlot (editor’s translation: High). His interest in words was visible, however, not only through his writing but also through his paintings. In the mid-1980s, he began creating canvases that would feature the same word in different languages. The grammatical gender of the word would determine its colour: blue was for feminine, red was for masculine and green was for neuter. 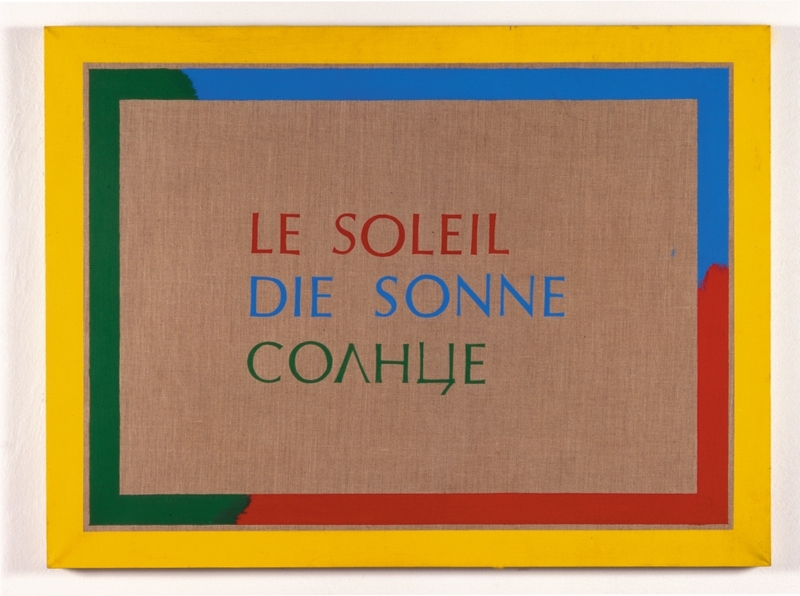 This piece, Słońce I (editor’s translation: The Sun I), features the word ‘sun’ in French, German and Russian (reading from top to bottom).